The Hydraulic Conductor Winch Puller is widely used in overhead transmission line tension stringing operation. 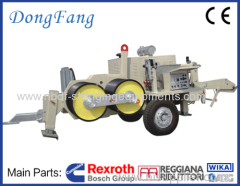 We can produce the winch puller from 3 Ton capacity to Maximum 40 Ton capacity. The big hydraulic cable puller with 30 ton and 40 ton capacity have been used in 800 KV and 1000 KV power line in China. All the winch pullers are equipped with diesel engine and hydraulic pump and motor system. 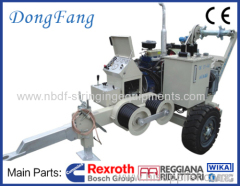 3 Ton Hydraulic Winch Puller is used for overhead transmission line single conductor or OPGW stringing. The machine is equipped with Sauer Pump. 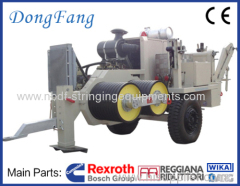 4 Ton Hydraulic Winch Puller is used for overhead transmission line single conductor or OPGW stringing. The machine is equipped with Cummins Engine. 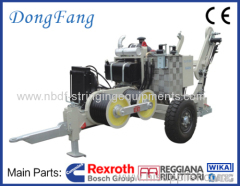 6 Ton Hydraulic Winch Puller is used for overhead transmission line single or two conductorsstringing. The machine is equipped with Cummins Engine. 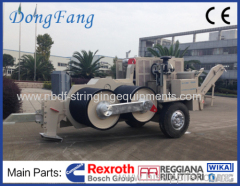 9 Ton Hydraulic Winch Puller is used for overhead transmission line single or two conductors stringing. The machine is equipped with Cummins Engine. 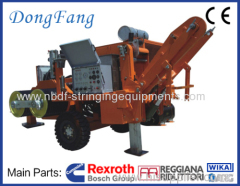 18 Ton Hydraulic Winch Puller is used for overhead transmission line two or four conductors stringing. The machine is equipped with Cummins Engine. 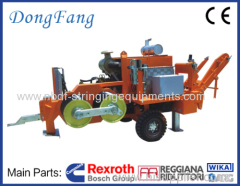 22 Ton Hydraulic Winch Puller is used for overhead transmission line four or six conductors stringing. The machine is equipped with Cummins Engine. 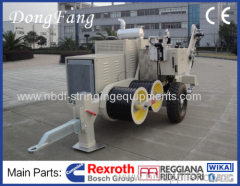 25 Ton Hydraulic Stringing Winch is used for overhead transmission line four or six conductors stringing. The machine is equipped with Cummins Engine. 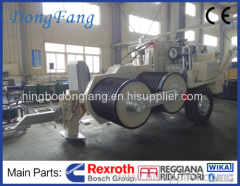 30 Ton Hydraulic Winch Puller is used for overhead transmission line four or six conductors stringing. The machine is equipped with Cummins Engine. 40 Ton Hydraulic Winch Puller Machine is used for 1000 KV overhead transmission line stringing, for pulling 4 big conductors up to 48mm diameter. Cabrestante Hidraulico para el tendido de cables aereos de Alta Tension, son maquinas disenadas para tirar de las lineas y cables durante Tendido. Hydraulic Cable Puller is used for overhead transmission line conductors or OPGW cable stringing. 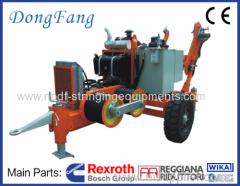 The machine is equipped with Rexroth pump and motor. 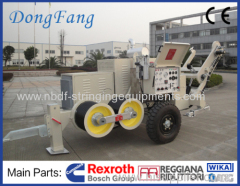 We are the biggest manufacture of Conductor Stringing Machine (Hydraulic Puller) for Overhead Transmission Line Stringing Operation in China. Group of Conductor Winch Puller has been presented above, want more	Conductor Winch Puller and Hydraulic Conductor Winch Puller, Please Contact Us.